Who Knew? 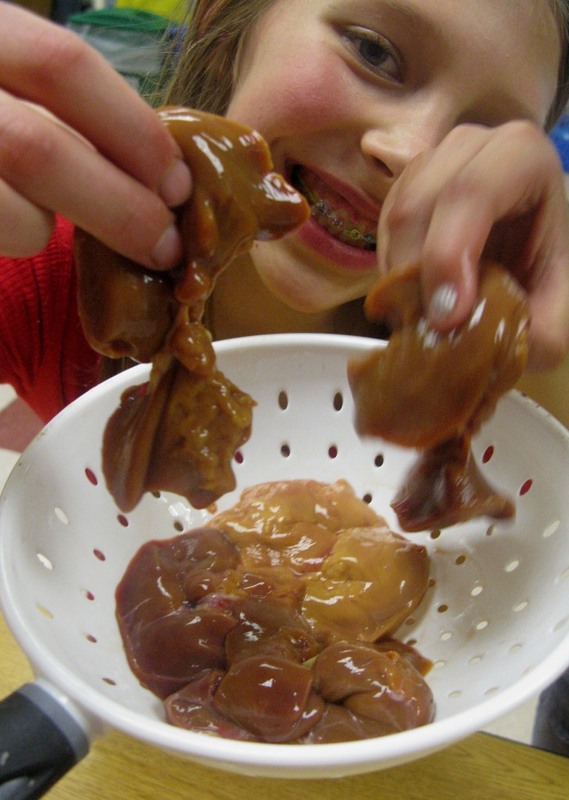 Kids Love Chicken Liver! Sometimes I like to test the kids in my food appreciation classes with a food I’m sure they’ll find repulsive. Not long ago it was squid. This week, I brought them chicken liver. And just to challenge them even more, I urged them to pick up with liver in their hands and feel it. Pretty gross, no? This was all part of our continuing world culinary tour. We’ve been lingering in Spain recently, cooking all kinds of tapas or small plate dishes. But it was time to move on to France. The southwestern part of that country is known for its various treatments of ducks and geese, as in confit of duck–or duck preserved in its own fat–and turned into a delectable stew with beans and pork called cassoulet. I would love for my kids to make cassoulet, but it takes about three days to prepare properly, so I searched through Paula Wolfert’s definitive book, The Cooking of Southwest France, and found a recipe for a watercress salad with duck (or chicken) liver. Not having ready access to duck liver, I opted for the chicken liver at the local supermarket. I also switched baby salad greens for the watercress. In any case, this is a wonderful salad with crisp apple, strips of salami, walnut oil and sherry vinegar–ingredients we don’t use every day, but truly representative of a certain part of the world where they pay close attention to the flavors derived from particular local ingredients. Start by soaking one chicken liver per person in lightly salted milk for at least three hours. I’m not sure exactly what the milk is supposed to do, except perhaps soften the liver flavor. Then rinse the livers thoroughly in a colander and drain them well. Set the colander aside over paper towels so the livers can dry a little while you prepare the rest of the salad. You’ll need half of a crisp apple, unpeeled and thinly sliced. Toss the slices with the juice from 1/2 lemon, then add 1/2 leek, cleaned and thinly sliced. Add a mix of baby greens–or watercress if you have it. Cut one slice of garlicky salami per person, then cut the slices into thin strips. Set aside. In a separate bowl, make a vinaigrette with the juice of 1/2 lemon, 1 tablespoon sherry vinegar, 1 tablespoon walnut oil and 2 tablespoons extra-virgin olive oil. Season with salt and freshly ground black pepper and whisk until thickened. To finish the livers, cook in a heavy skillet with plenty of butter over moderately low heat. You don’t want to burn the livers, just cook them gently until lightly browned. Turn them once. When they are cooked through, remove from heat. Toss the salad with enough vinaigrette to lightly coat. Arrange the salad on individual plates and garnish with the sliced salami. Place chicken livers in the middle of the greens and serve. Watch the kids gobble it up. I think it’s great how you urge your children to learn a lot of new different things through your cooking, and you get to bond with them too. Great articles! Keep them coming. It was made with vegetables grown in our own garden, including a kind of meaty lima bean. You cook it in a casserole in the oven topped with bread crumbs. I like your idea of adding bacon. This is brilliant; thanks! My toddler gobbles chicken liver like they’re going out of style, and I can only handle the bacon/onion combination so often. Plus, I have a bottle of walnut oil hiding in the dark depths of my pantry waiting for a purpose. I’d say this is Friday’s dinner (because the livers come from our chicken people at the weekly market on Fridays). Congrats to you broad approach is eating with kids. I myself have very fongafale me rotors of eating experiences with both my mother and maternal grandmother. Sardines as a young boy. Kidneys fried on the stove. Stuffed beef heart and the best memory which I continue with my own kids … Chicken livers fried sufficiently for crisp outside and slight pink interior .. Ah, fond memories. Thanks!